Participants are guided through terminology, telephone techniques, room reservations, check-in and check-out procedures, guest inquiries and complaints, accounts, and administration performed by hotel front desk agents. Participants will experience the physical stamina required as a front desk agent multi tasks and trouble shoots each client contact. 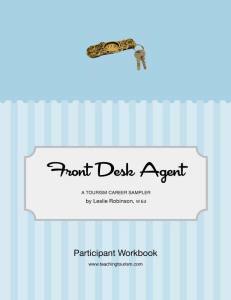 Front Desk Agent is now available for online delivery! Click here to register.